It is very much a tradition in Kamloops to decorate the entrance of your home with fresh greens, cones and twigs. People then add their greens to the inside of their home, which brings a scent of the outdoors in. 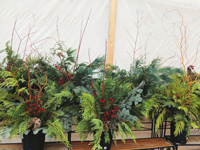 Cedar and White Pine are the backbone of your decorating, with Silver Fir, Mountain Hemlock, and some specialty greens to complete your display. For special highlights, use the Incense Cedar – with its yellow pollen tips, Boxwood – with its rich, green leaves, or Berried Juniper boughs. This year, we have Huckleberry branches with leaves (normally they are just bare)! The Huck, as we call it, will stand up well in our cool winter weather. Curly Red Willow, Red Dogwood, and other twigs are all great for centre height in urns and as accents around your entryway, woven into your display. You can also add some mini lights to really create that “WOW” factor! My favourite touches are the sprays of red berries and Rose Hips, as well as large sugar cones, Jeffrey cones, and the Mini Scots Pine cones. 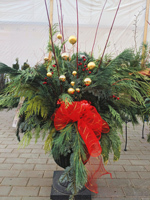 Simply tuck them into your greenery or urns. Pre-made wreaths, roping, and mantle pieces can be dressed up with ornaments, bows, and berries to finish off your display. Don’t forget to spray your display with Wilt Pruf, an anti-dessicant which puts a clear, waxy film on your greens to extend the life of your display, inside and out!